As expected, a bobcat hunting/trapping bill (House Bill 1407) has been introduced in the Indiana General Assembly. The language of the proposed bill defines a county “eligible” for a bobcat season as one that has surpassed a minimum of thirty (30) reported bobcat sightings received by the “department” for two consecutive years between Jan. 1, 2016 and Dec. 31, 2018. Whether these reported bobcat sightings were real, mistaken, duplicative, or fraudulent is apparently of no importance. Verification by IDNR is not required. The only requirement was that someone reported a sighting to the department. The window for reporting bobcat sightings is officially over, and surely IDNR has already tallied the handful of statewide sighting reports it has received. Yet, HB 1407 fails to disclose which counties qualify for a bobcat hunting/trapping season. According to the bill’s primary author, Rep. Lindauer’s office, the bobcat season is necessary because of “nuisance” concerns including livestock depredation and property loss. These concerns, even if legitimate, fail to justify an open bobcat season. This bill indiscriminately targets all bobcats in eligible counties merely for being present—by definition ignoring whether they’ve been a so-called “nuisance” or were just unlucky enough to be spotted in an eligible county. 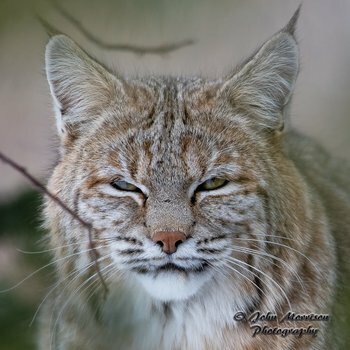 “We get very few reports of bobcats being a nuisance of causing damage”. This, of course, begs the questions then, why would a statute be needed if complaints are minimal and problematic bobcats can already be legally controlled? House Bill 1407 proposes a recreational bobcat hunting/trapping season. Recreational hunting/trapping and “nuisance” control are two distinct activities, each serving an entirely different purpose and governed by separate licenses and regulations. These distinct activities are also guided by different methodologies and articulated objectives. The problem for IDNR and bobcat hunting proponents is that managing perceived “nuisance” bobcats under the authority of a wild animal control permit generates no revenue. IDNR does not charge a fee for this permit and the property owner or his/her agent assigned to kill the targeted animal, is prohibited from selling, gifting, trading or bartering animals taken. The bill’s coauthors, Representatives Bacon, Lindauer, and Bartels, are the same elected officials who hosted, along with the IDNR, at least one closed-door meeting exclusively for hunting and trapping proponents for the purpose of discussing a recreational bobcat season. This October 2018 meeting came on the heels of the NRC Secretary’s motion to the Indiana Natural Resources Commission (“NRC”) to withdraw a similar bobcat hunting/trapping season proposal (LSA Document #17-436, April 17, 2018) following intense public opposition. According to the unedited notes from the October 2018 closed-door meeting, “50 plus” supporters of consumptive use (i.e., hunting, trapping, etc.) were in attendance. Any shortcomings on the part of IDNR to satisfy the “more than thirty (30) bobcat sightings” per county threshold to qualify a county for bobcat hunting eligibility was likely easily remedied during this meeting alone. House Bill 1407 has been deliberately tailored to advance IDNR’s failed agenda of establishing yet another predator killing season. If adopted as proposed, this bill will enable the “director” to circumvent all future public input on this issue while simultaneously flipping a middle finger to those who showed up in force to oppose a similar measure in May of 2018. Dodging public input is a pattern and practice of IDNR. And the Indiana legislature seems far too willing to intervene to push IDNR’s agenda regardless of how ill-conceived it may be. If a recreational bobcat hunting season is established, bobcat hunters will be able to hunt these animals with packs of hounds. Additionally, there is nothing that would legally preclude these animals from being targeted during predator competition kills, similar to the coyote and fox killing derbies currently held in Indiana. House Bill 1407 leaves no doubt as to what was behind those dark meetings hosted by the Indiana legislators and IDNR. The only unknown at this point is whether the public is willing to tolerate its legislators and state agencies abusing their power and utterly ignoring the resounding opposition Hoosiers clearly expressed. Comments may be sent to Rep. Lindauer at: h63@iga.in.gov. In 2016, the Center for Wildlife Ethics published “Killing for Fun(ds)” to highlight the state wildlife agencies’ financial dependency on license sales that perpetuates the recreational killing of wildlife. The article also addressed The Federal Aid in Wildlife Restoration Act (commonly referred to as the Pittman-Robertson Act) – a constant and indefinite wildlife conservation funding source derived from an excise tax on firearms, ammunition and archery equipment. Since Pittman-Robertson was first enacted in 1937, more than $10 billion dollars have been channeled to state wildlife agencies and “stakeholders” who support recreational killing of wildlife or profit from it. Wildlife agency budgets rely heavily on recreational killing license sales and matching federal funds sent to the agencies under Pittman-Robertson. Thus consumptive users (a/k/a hunters and trappers), a very small yet vocal lobbying minority, are elevated to the agency’s primary constituency. The consumptive users’ interests and demands routinely dictate wildlife policies due in part to Pittman-Robertson’s matching financial scheme. In essence, the economic influence of hunters and trappers is literally doubled along with their political influence. Meanwhile non-consumptive members of the public whose agendas are not amplified by federal government funding are all but ignored. This cozy relationship is one reason compassionate voices seeking nonviolence in wildlife policy are so frequently silenced. Notably, the steady decline in hunting participation and the wildlife agencies’ reliance on an inequitable and antiquated funding system has created a shift in agency culture. Rather than focusing attention on preserving natural lands and resources for all, the industry is focusing increased efforts on peddling killing opportunities and crafting clever linguistics to convince the public that it has their best interests in mind. Although messaging surrounding Pittman-Robertson has consistently applauded hunters as the sole contributors, the non-hunting public increasingly contributes to this fund. The conservation community is acknowledging the “downward trend in the national hunting rate” as evidenced by a recent article, “The Growth of Sport Shooting Participation” in The Wildlife Professional (March/April 2017). According to the authors[iii], “sport shooters who do not hunt now make up an increasingly important segment” of the shooting population. “Wildlife professionals, agencies and organizations will need to recognize the implications of this shifting demographic and take appropriate steps if the PR Act is to remain a viable user-pay, user-benefit program for wildlife conservation programs. Unfortunately, what has not yet been acknowledged by the conservation community is the vast number of sport shooters who value wild animals alive and would not support recreational killing if given a choice. Many of whom may also believe that truly conserving wildlife is incompatible with killing animals or growing wildlife populations for the sole purpose of satisfying hunter demands. It is also time to recognize the hunting industry’s assertions that hunters pay for everything is an absolute falsehood. The majority of the public and sport shooters are not hunters or more specifically, “users” of wildlife resources and they deserve a voice in how wildlife is managed that is proportionate to their majority status. [i] The term “sport hunting” refers to killing for fun, hobby or recreation. Neither the activity, nor the use of the word “sport” to describe it, is condoned by CWE. [ii] Mark E. Smith and Donald A. Molde, “Wildlife Conservation and Management Funding in the U.S., Oct. 2014. [iii] Mark Damian Duda, Tom Beppler and John Organ. Fur trapping, similar to other forms of state sanctioned violence against wildlife, is legal today because the time, place and manner of the brutality is conveniently shielded from public view. Broader scrutiny is deflected through clever messaging tactics employed by wildlife agency public relations experts who cloak this commercial activity as a necessary evil. Addressing all of the communication schemes employed for manipulating public opinion, silencing opposition, and whitewashing violence against animals could require one to author an entire book (or perhaps teach a graduate course at Cornell University, where so-called “human dimensions” studies includes such instruction). While this blog could not accommodate such a detailed analysis, it may be useful to focus this discussion on the art of conflation, or more specifically, when two or more concepts that share some characteristics are merged as a single identity to the point that the differences are blurred or become lost. The conflation of recreational (“fur”) trapping and “nuisance” wild animal control is a perfect example of how language is contrived to support and promote an agenda. Other than terrorizing wild animals though, these two activities have little else in common. Fur trapping and “nuisance” control are two distinct activities serving different purposes. Each activity is governed by separate licenses, applications and laws. Each depends on unique objectives, skill sets and measurements of success. A “nuisance” control permit is customarily free, yet a licensing fee is always imposed on fur trappers. “Nuisance” control consists of the selected removal of individual animals whose behavior or condition, such as illness, can be controlled. "Nuisance animal" is a vague label used, accurately or not, to denote an animal who is causing or threatening to cause property damage, or perceived to pose a health or safety threat to domestic animals or people. In Indiana, the hide of a “nuisance” animal cannot be sold, traded, bartered or gifted. And, in some states, anyone wishing to control “nuisance” animals for a fee, must satisfy testing, continuing education and/or annual reporting requirements. “Nuisance” problems can be remedied non-lethally. And, the mere presence of an animal does not qualify him/her as a “nuisance”. Conversely, fur trapping is indiscriminate and targets healthy populations of a chosen species, not individual problem animals. Fur trapping is regulated by particular seasons that correspond with the ripeness (plushness) of a specific species’ fur. Furbearing animals are either discovered dead in traps or killed by trappers, skinned for their pelts and the fur is sold for profit generating purposes. Fur trapping is always lethal. Wildlife agencies overseeing this activity also mandate the use of “game harvest reports”. Fur trapping does not control the spread of disease, including rabies, as sick animals are not attracted to bait. In fact, fur trapping may actually serve to exacerbate the spread of disease because only healthy, mature and potentially immune animals are the ones being killed, and therefore removed from the local population. Despite the numerous distinctions between fur trapping and “nuisance” control, these activities are routinely conflated by trapping proponents to promote and justify more killing. Wildlife agency personnel capitalize on an uninformed public and the nuance between fur trapping and “nuisance” control to disguise the gratuitous nature of the violence, while promoting still more consumptive use of wildlife. And, as evidenced by the Liddle v. Clark, et al., litigation, this tactic has also proven successful for opening up public lands, unbeknownst to the public, for private commercial gain. The twisted linguistics also establish a contrived need for trapping animals and enable state wildlife communication experts to package fur trapping as a necessary evil. By conflating these two activities, trapping proponents disguise recreational/fur trapping – an increasingly unpopular, commercial exploitation of wild animals – as a more acceptable, publicly palatable endeavor. As evidenced by the Liddle litigation, the communications and messages are all calculated for the purpose of creating an appearance of responsible stewardship over public lands and the public’s well-being while mischaracterizing an otherwise secretive, dangerous, and morally reprehensible activity. It also allows connected insiders from the private sector to access public lands for commercial gain. Center for Wildlife Ethics is working to expose trapping industry cruelty and the purposeful conflation of fur trapping with so-called "nuisance" trapping. If you have information on an animal trapping incident and would like to assist CWE's efforts to stop trapping cruelty, please complete our online survey.